Everyone who has Internet connection need a kind of router and each machine needs some operating system code to run that. DNA-A211 is a router provided by BSNL in India, and It does have a OS Running inside and to the grace of GNU its running GNU/Linux inside, having Minimal BusyBox Pre-loaded.. So, How do I access this machine?? 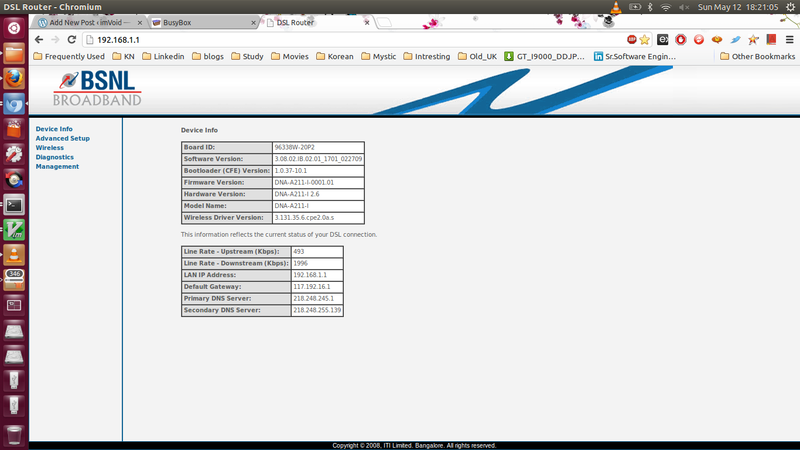 We all usually access this using the Web interface provided by BSNL, generally running on port number 80. To access that, access this IP through any web browser.. So, If its not this IP, How can I find the IP of my router? Okay. I got it and able to access this through the web interface.. But how can I access the shell?? Even though it has linux under the hood and has a minimal busybox, it doesnt provide all services like SSH. But it does have telnet running inside. So just try this with user name as admin and password as admin in-case if its not changed. Voila.. I got in… Now what next?? Okay.. How can I launch the Busybox shell?? Run this command in the prompt..
Now you can play with the available commands in this..